"I need to find a free video converter where I can choose the format to convert to, has no watermark on the finished product, and converts the ENTIRE movie. I used to use Real Player converter until they stopped making it free." When seeking for a free video file converter for Macwith no watermark, you will easily notice that many other people are also facing the difficulty in finding a reliable solution that helps to free convert video file to Mac without watermark and other limitations. MacX Video Converter Free Edition is an ideal Mac free video file converter to convert videos between a wide diversity of formats without watermark, time limit or file size limitation. If you are looking for a free program to free convert video file on Mac OS Mojave, or convert videos for playback on iPad, iPhone or Andriod, this will definitely cater to you need. Top Free Video Converter Download Now! 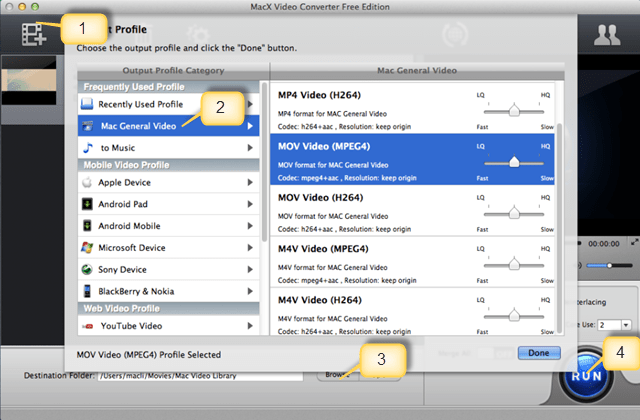 Best Mac video converter freeware to convert MP4 MOV AVI MKV, etc. to various formats for iPhone iPad Android playback super fast speed & no quality loss. Supporting converting mainstream HD and regular video files, this top notch video file converter for Mac works perfectly to convert high-definition video files like MKV, AVCHD, M2TS and SD video formats, including AVI, MPEG, MP4, DivX, XviD, MOV, FLV, RM, WebM, Google TV etc. without any watermark left on the video image. Free get the full function software and you are allowed to use it for lifetime to convert AVI to MOV, MKV to AVI etc. Meanwhile, MacX Video Converter Free Edition can also be used to convert video clip to iPhone XS/XR/8/X/7/6S/6S Plus/6/6 Plus, iPad mini 4/Air 2, iPod, Android Samsung HTC Sony and more. Free download this video file converter for Mac and run it. Click "Add File" button to browse the video files saved in the hard drive and select files you want to convert. Select the specific output format or device in the output format area, such as MOV, MP4, AVI, YouTube, iPad, iPod, iPhone etc. You can also change audio and video parameters there as you wish. Click the"Browse" button and choose the location where you would like to save your converted files. Click "RUN" button and the conversion begins, and it will convert video with no watermark and take only few minutes to finish the whole conversion. For those who have the need to convert more video formats and transfer all video files to iPad, iPhone, tablets and other devices, the advanced version named MacX Video Converter Pro would be a great choice. This versatile Mac video converter also works as handy YouTube HD video downloader as well. Familiar with iSquint? Doesn't matter if not, cuz here you will know a thing or two about it. 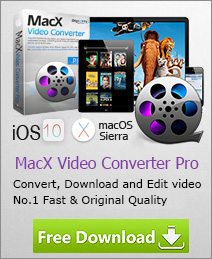 This free Mac video converter app is warmly welcomed by the Mac users to free convert video files to iPod devices. Now another good news is that this Mac free video converter also supports to free convert videos to iTunes so that you can eventually transfer videos from iTunes to iPhone iPad iMovie Apple TV and more Apple devices on MacBook Pro/Air. One of the biggest merits of FFmpeg goes to its variety of file formats. See, it can hassle-free convert almost any format to the file format playable on any mobile device, for it combines SD and HD decoder perfectly and adds over 30 new filters into its library. Use its own slogan to conclude: "Convert video and audio has never been so easy". Don't judge a book by its cover. VidDownloader do does its video downloading job to free download online videos from YouTube, Google Video, iFilm, Blip.TV, DailyMotion, etc. But that's not all that it can do. It can even convert videos to a playable format, you just name it! 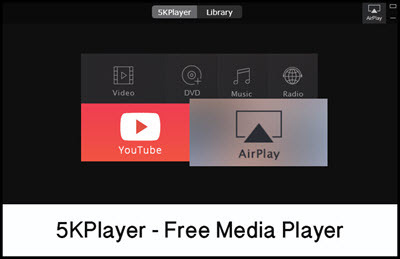 5KPlayer, works excellently in video and audio playback on Mac and Windows. But remember, it's an all-round video player, which also supports you to free download video to MP3, AAC audio and convert videos to any format you need with a built-in video converter app. It's free, feature-rich and easy to use. It can meet all your needs about the multi-media files. A watermark refers to a recognizable audio, pictures, text, 3D model or video, which is embedded information into a digital signal which can be used to verify its authenticity or the identity of its owners of the media. If the signal is copied, then the information also is carried in the copy to provide copyright protection for the media. Wanna convert MKV to MP4 on Mac (OS X Mountain Lion/Mavericsks/Yosemite included)? While stay on the page and you will get a good video converter for Mac OS X Mountain Lion, Mavericks and Yosemite, Mojave helping you convert MKV format to MP4 with ease. Detailed guide about how to convert WMV to MOV on Mac OS X with a WMV to MOV Converter for Mac that seamlessly supports WMV format.